And as one portal appears to close, others open. This story should be read alone, at night. Betty, the chief librarian of a small New England library, has inherited some troublesome books. Not the ones that are just hard to read. The other ones, the books that consume others and become powerful. Powerful enough to change the world. Now some of Betty's friends have stumbled on a library that does the same. It is being written here from time to time, on paper. 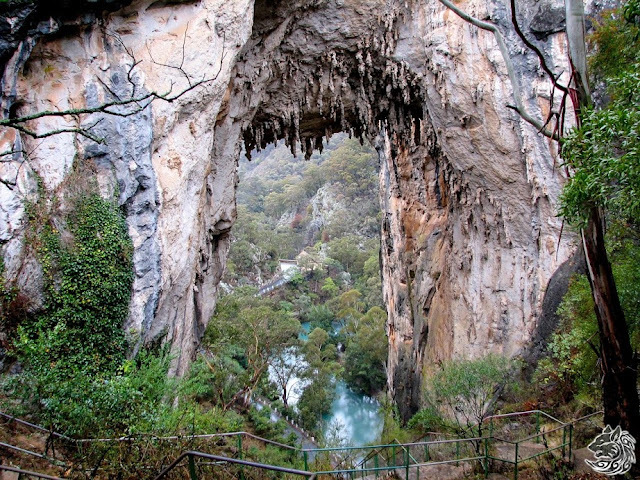 A trek along the Jenolan River below the caves and beyond the Blue Lake will take you to places unimaginable. If you do step through this portal, a portal of ordinary natural power, you will never be able to go back to the world you knew. Not because of magic, nor the sharp smell of herbage all around nor the gin you drank last night. If you must go back, you will go back to a world changed. It will be a world where the colors are faded and the shadows are darker. The black cat made its way by leaps and bounds up the vines leading to the mantle of the highest window of the old library. It hissed and a great raven left in a complaint of feathers and claws. The cat pressed its eye to the cold glass. From here it could see the old librarian at her desk on the first floor and the dark rooms of the town museum on the second floor. The cat reached out and pushed the glass. Betty sat at her desk waiting for assistant librarian Thelma to arrive. She took a deep breath and reviewed her concerns one last time. Thelma was young, smart and... Betty frowned. Betty ran through the prosopography of all library assistants past and present. She clenched a fist and slammed it into a waiting hand, "She isn't ready!" The dust behind her stirred and twisted into the air. A chill filled the old library. Books shuffled on the shelves. Upstairs, in the old museum, the floor settled softly. Betty listened for calm to be restored. Betty looked at her desk, immaculately clean. She mumbled, "Or maybe it is just that I am not ready for this." She heard the shuffle of feet outside the Library and the practiced turn of a key. The door opened, and Thelma gave her a wave and a cheery hello before moving to knock the snow off boots and to shake out her umbrella. Thelma forestalled Betty’s remonstrance, chirping without a hint of defensiveness, "I will clean it up. The landing was too muddy." She hung her jacket and ear muffs on the old wrought iron rack and went to find a mop. Betty said to herself, "I just came in there myself, it wasn't muddy then." Young people these days are far too casual with the truth. And then, again, the doubts started. Thelma said, "Ok, I have two hours. Sarah is babysitting for me. Would you like a coffee?" Betty was caught off guard, "When did Sarah come home?” They looked at each other across the library for a moment, and Betty broke first, “Yes, I need a coffee." Betty bit down the warning sitting at the back of her throat. Betty said, "Thelma, I need to tell you something." Thelma put two coasters on the desk and pulled up a chair, "I know already." Betty said, "What? What do you know?" Thelma said, "It's about the Arthur Conan Doyle exhibit." Betty shook her head but could not help herself, "Sir Arthur Conan Doyle. And it is the Sherlock Holmes Exhibit. Remember that here we name exhibits after books not writers.” Like most librarians, Betty had a poor opinion of writers: at best a necessary evil; at worst intrusive and self-serving. Betty fought to restore self-control, but curiosity got in the way, “What about the exhibit?" Thelma took a sip of the coffee, "Well, I think we should tell the truth about Doyle. The whole truth." Betty suddenly wondered if two hours was going to be long enough. She said, "What?" Thelma said, "Well, you know he was a doctor in the Anglo-Boer War." Thelma continued, "He was at Bloemfontein, at the height of that city's typhoid fever epidemic. A thousand soldiers died there. He saw it happen and knew how to prevent it. Instead, he caved in. He could have easily prevented so many deaths." Betty started to put her hand up, but Thelma rushed, "In the first World War, more people died from typhoid than on the battlefield. If Doyle had stood his ground, typhoid deaths would have been eliminated. We have to..."
There was a crash from upstairs, and the lights flickered. Out of sight, deep in the recesses of the library, the surface of a book shimmered. The book was covered by a pattern of tiny scales; regular, fascinating and frightening. The two librarians looked at each other and froze. Silence returned. Betty shook her head, “Maybe just the wind banging one of the old windows.” Thelma looked at her, wondering about the disruption from a couple of weeks earlier. Seeing her chance, Thelma continued, "So many..."
There was another crash from upstairs. This time it was followed by the sickening splitting sound of wood. Betty jumped to her feet as the light died. She shuffled in her bag and drew out a large metal torch, the weapon of choice of most senior librarians. She switched the light on directly into Thelma's eyes. Betty hissed, "No. I do not want to talk to you about the Sir Arthur Conan Doyle exhibit. Will you just listen to me for a moment!" Thelma squinted and turned her head from the torch light, and said conversationally, "So, can I include a small section in the exhibit about him being the greatest killer in world history?" Betty remembered Mabel's warning, delivered with a wavering voice, "I pray you never need to concern yourself with these, the ones that twist and turn in the dark." Betty whispered loudly, "Thelma! There might be something upstairs. I need you to believe me regardless of what you might think." Thelma said with the confidence of youth, "You said it yourself, it's just the wind." Betty started, “No…” but the lights flickered a couple of times, and then resumed with a dull golden glow. Betty snapped off the torch light and wondered about the wisdom of climbing the stairs. She resumed her seat and thought. When Betty had become the chief librarian, she had done things that Mabel would never have allowed. Betty repressed her reservations about telling the towns folk that their favorite author was a mass killer. Instead, she turned to Thelma, "You can include an extract from a reputable source but only if you promise to believe everything I am about to tell you." Thelma smiled and risked a happy cry, "You are the best!" Betty caught a flash of light, near the ceiling. Thelma followed her eyes, and took a swig of coffee, as a single page floated slowly onto Betty's Desk. The page was old, hammered leather, frayed at the edges patterned with centuries of book worms. The script was old, amendments in the margins. The letters swam in front of them. Thelma said comfortingly, "See, just the wind." Betty reached for the page, and the words on the page swirled and became tangible. Betty stared at the page in her hand. Vox (to his love): For you, I will break all the rules. I will risk incurring the displeasure of the emperor. I forgive you all the faults of time and distance. For that is the duty imposed by love. Echo (Emperor): Love imposes that duty. They were silent for a moment. Thelma returned to her seat, a thoughtful look on her shoulders, "It seems familiar, but I can not say I know it. Is there anything on the other side?" Betty shook her eyes out of inaction and turned the page over. She said, "Nothing." Thelma said, "It came from upstairs, probably the Town Museum. It may have been up there for years. The wind found it." She glanced at her watch and smiled. Betty nodded, "I wonder what other surprises might be waiting." Thelma said, "We will deal with them, together. Old pages from forgotten books are no match for us." She laughed and then asked, "I am sorry, we have drifted a little. You were about to tell me something important." Betty smoothed out the page and reaching into her second drawer, pulled out a paper sleeve and stored the page carefully and put it away out of sight. Betty started, "Yes. Now, remember that you are going to believe everything I will tell you." Thelma looked seriously, "Some bizarre things have been happening here." Betty looked at her sharply; maybe she had underestimated Thelma, "What do you mean?" Thelma leaned a little towards Betty, "Well, you know the Library Writers Club you asked me to manage a while back... I send you the minutes." Betty frowned and then squashed a pang of guilt, "Thank you. I do not have time to look under every stone and appreciate you taking care of that one. But, perhaps I should have been more attentive, they are a difficult bunch of individuals." Thelma said, "There are not too bad. We meet each second Monday at the Toni's Diner and, well, I listen to their stories and try to encourage them." Betty said quickly, "Please, not too much encouragement. There are plenty of good books out there already. Look, I know that writers are a strange lot. But, what is particularly strange about this group." Thelma said, "Well, I worry about them. They were all just muddling along. It was social. Well, a couple of meetings ago, a new man started coming along, Ged Richards. He is a local farmer and says he knows lots about books and writers and publishers." "Tell me the strange bit, please." "Well, he has been helping the others finish off their writings, even Jess. And, he is going to bring a well-known writer from the city next meeting." "It sounds like you are doing a good job, rather than being strange." "But Betty, my writers haven't got a clue." Betty nodded, quietly approving of Thelma's intuition. "And yet suddenly, they have manuscripts full of writing and plots and characters." Betty picked up her ears and was about to probe a little deeper, but with a superhuman effort of will dragged the conversation back to the purpose at hand. "Thelma, I think you are doing a good job. And we can talk a bit more about your writers tomorrow, but I need to talk to you now about something more important." Thelma said, "I am sorry Betty, I have spent your evening talking about my problems. I appreciate your support of the Sir Arthur Conan Doyle exhibit. It has all been a bit hectic the last while and..."
Betty held up her hand and smiled, "Thelma, that is what I need to talk to you about." Silence filled the library. The books crowded to the edge of their shelves. The black cat leaned against the stairwell listening. "Thelma, I am feeling very old." Thelma drew in her breath. The dust behind Betty stirred and twisted into the air. A chill filled the old library. Books shuffled on the shelves. Upstairs, in the old museum, the floor settled softly. "The last week was very hard for me. I need to talk to you about it. Then I think we should talk about my retirement." With a squeal of rusty hinges, the black cat left the library. It slithered and backed its way down the wall, shrugging off a snowflake as it disappeared into the night. Moments later it pushed its way into Toni's Diner and bent to a bowl of warm cream in the kitchen. Suddenly, its ear pricked up. Alert, it turned to look at the row of tables. At the end Jess rose with a frown to meet Ray, "I am glad you came. Can I get you a hot chocolate?" He nodded, and she called out to Toni. The black cat turned back to the cream, unsure. The cream tasted sour. Jess said to Ray, "I have a problem." Toni arrived and said, "Be with you in a moment. Just feeding the squad car, they had a car off the bridge tonight and are a bit shook up." Ray took out a scrap of paper and made a note, saying, "Sec. Need to jot that down." Jess didn't wait, "I have been trying..."
Ray finished and said, "You told me. But I have my book to write. I still have 900 words to write tonight and..."
Jess said, "No, I have a huge problem." Ray said, "We have talked about this. You have to kill Bernice." It was a little too loud, and the conversation in the diner dropped perceptibly, so he added loudly, "Bernice, the character in the book you are writing," He stressed Bernice and writing. Both of them waited for the diner to fill with normal disinterested conversation. Jess said, "I can't do it. I..."
Ray sighed loudly, and whispered loudly, "We have been through this. Look. Killing a character is hard. It took me weeks to get the nerve to kill my first one. But a bit of practice and, you know, it gets effortless. Before you know it, you will be killing off whole families, little children, cities, kittens!" Jess looked around worriedly and nodded silently at the police officers sitting a couple of tables down, and whispered loudly with a gentle kick under the table, "Don't say 'kill.'" Ray said, cautiously, "You have to do this Jess!" Ray had had this conversation a couple of times, and his patience was wearing thin. He looked at the police officers, who had stopped eating. "Here. I will show you." Ray moved his hand in the air theatrically and hushed Jess. He brought out a piece of paper. "Watch." The Black Cat silently jumped up on the seat back behind Jess and peered down at Ray. Ray wrote, "Bob finished putting on his tie and picked up the flowers he had bought earlier." Ray explained to Jess, as an aside, "See, the flowers make him a character of value. When we kill him, the reader feels a loss." He nodded his head, silently asking her to agree. Jess said, "No. No. You..."
Ray said, "It’s alright Jess. It will be all over shortly. It is just words." He continued to write a little faster with every word, "A block of ice fell onto a nearby wall. A dislodged brick shifted imperceptibly and lost grip of its neighbors.” He looked at her, and wrote one more sentence, “Fate hung in the balance." Jess watched helplessly, eating her own words. Ray wrote, "Just then, Ray slammed the door, and walked to his appointed fate." Suddenly there was a crash outside the diner. The cat jumped onto the table, dislodging Jess's manuscript and for a moment chaos reigned. Toni stomped out of his kitchen with a soup ladle, opened the door and peered out into the night. Toni shook his head, "Careful when you leave tonight folks; another brick has fallen off that dratted wall." He called out to the police officers, "Can I put in a complaint about that?" One of the officers called back, "Come on Toni. You know the drill. Call City Hall." Jess called to him, "When you have a moment, can we have a couple of hot Chocolates please Toni?" Toni turned and shot a smile at her then shook his head. Jess and Ray finished getting the papers back into order, and Ray turned back to his exercise. Ray held his hand above the page and froze. Written on the page, under his writing, in a narrow painful text, were six new words he had not written, "The brick fell after he passed"
Ray looked at Jess and then looked back at the writing, vaguely annoyed at the lack of a full stop. He looked at Jess again, and his eyes narrowed. Jess said, with a rush, "I have been trying to tell you." Ray asked, pointedly, "Did you write that?" He pointed to words, which had been inexplicably joined by a couple more and some punctuation. It now read, "The brick fell after he passed, and just after he sat down" Still, there was no full stop. Ray suddenly felt cold. Jess shook her head, "Listen to me." Ray shook his head and put his hands out. She pulled out pages from the top of her manuscript and put it on top of his note. "Look!" She pointed to her writing and, just as he was about to remonstrate pointedly about the incomplete sentence now in his example death scene, he noticed the same narrow painful text on her page. A hasty thesis formed in his mind and he blustered, "What are you doing!" Jess simply said, "I don't write like that. Something else has been writing in my story." Jess said, "I sat down to write tonight. After my talk with you. I told myself that tonight was the night I was going to..." Her voice trailed off. "You know..." Her voice dropped to a whisper, "Kill Bernice." There was a hush in the air. Ray's eye caught the eye of one of the police officer a couple of tables away, who had a ham and tomato burrito in his mouth but still finding time to look at them with a little too much interest. Ray's heartbeat got louder and started to pick up the pace, "Ok, ok. Let's not put the other people here off their food. Let me read what you wrote." He started a couple of lines about the strange text, "This time Bernice had gone too far. She had slept with his girlfriend Meg. She had abducted his cat. And she had burnt their office to the ground. He had no options left. She was going to pay for all the bad things she had done. He gunned his car once more and waited for Bernice to leave the club." Ray stopped at that point and looked up at Jess. They had been reading each other's novels for a while now, and Ray had thought he had an idea about Jess's plot and the character development in her story. They had spent a little time on Meg, the clothes she wore, the cigarettes she preferred, her weakness for Dutch licorice. But nothing hitherto had been mentioned about Bernice sleeping with Meg. Ray felt a bit blindsided by this development, and by the inexplicable lack of another full stop. He started to point, but this time Jess got in first, loudly, "I have been trying to kill her all day! I blew up their office. I fixed her car so it would spin off the bridge! And now..."
The policeman standing next to her with her gun drawn said, "Now?" She left the police station in a daze. The police officer was full of small talk, but she was still on edge, images of the interview room light, cold cups of coffee seared into her eyes and soft words from the town librarian. She stumbled out of the police car, hoping no one in her street would be curious enough to look down on her strange arrival home. The police driver said things to her then, but the words didn’t register: just snowflakes that melt into the skin. Inside, she locked the door and rested against it. She ignored the mobile ringing in her bag, throwing it onto the bed and making her way unsteadily to her small kitchen and tossed down a glass of water. The mobile was still ringing. She looked at the bathroom, but ended up on the bed, taking the bundle of her manuscript, the police docket, and Ray’s notebook. She sighed, and the phone tumbled onto the bed. She picked it up and flicked answer. As Ray spoke, her eyes rested on the top page of her manuscript. She whimpered. In the darkness, she felt a tendril of smoke dancing nearby, searching for her. She fell off the bed, and half ran into the bathroom, shutting the door behind her. The Black Cat snuck in through the back door of the cafe. Maxwell bent down and scratched the cat's head, then lifted his watch and looked back out of the cafe's window. He saw her walking along the uneven pavement, tall and proud, shoulder set and head a little back. He started to smile, his mind filled with a spill of words, the wind catching the smoke wafting from her mouth and her scarf ruffling the edge of the mind. A gust of snow silhouetted her as she paused to let a council plow push past, and then she picked her way carefully across the icy road. By the time she had sat down, the story in his mind had advanced to drinks at a bar and the exchange of glances. "Snap out of it, if you don't mind. Maxwell." Maxwell gave her a dreamy look, "I think I got 500 words then." On a piece of paper in front of him, he was doodling. "Don't you dare write about me!" She called an order to the waiter. The waiter moved a little reluctantly from the TV, playing a documentary on Sputnik, "This is the beginning of a new era of Mankind. The era of Man's cosmic existence. "You will now hear the voice of the Russian Moon, Sputnik!...." The Russian voice faded into the hiss of the coffee maker. She glanced at his paper, nothing but half butterflies. Maxwell said, "I am glad you could make it." She nodded and drew out her notes. In the background, the documentary continued, "All over the world, people are tuning in to the 'Bleep Bleep' of the satellite..."
Maxwell started, conversationally, "I was too young for Sputnik. I remember Apollo, though. Good times." Annapurna sighed, "My mother and I watched the repeats on News of India at the theatre. I so wanted to to be a cosmonaut." She thought for a moment and smiled, "I still do, and a cricket player." The waiter brought two steaming mugs of coffee, and a small bowl of cream for the cat, adding with a slight shrug, "Sorry, no teaspoons, all I can offer you is a fork." Annapurna' s eyebrows lifted, "This is most irregular." She smiled, "Tell me, Andy, what disaster has befallen the kitchen of the great Chef Fred Murphy to occasion such a loss?" Andy shrugged again, "Someone pinched them all." He reached for the tv, reducing the sound a little. Maxwell took a long sip of coffee and then said with meaning, "Thank you. And thank you for the words." She nodded at his doodles, and asked, "Your writing, it is proceeding well?" Maxwell laughed, "You know, I always liked drawing little shapes, but now the words are all over me. Hell yes, the words are just dripping off my pen. I can't stop. Everything I see become part of the story. And the..."
She cocked her head and with a click at the back of her throat brought him to a stop, "I am pleased you are writing, but remember our agreement, please. I am not a fan of romantic novels. The details are too... steamy." Maxwell came to a complete stop and added another couple of lines to the novel in his head. 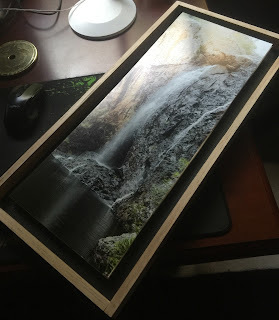 He said, "I am sure you will love this one." She said, "No, Maxwell, I would not. But, I am pleased to be here to lend you a little encouragement and inspiration. And, maybe, one day you will write a piece that does not involve touching and kissing and..."
Maxwell thought and quickly added, "...fast cars. And exotic resorts in faraway places." He remembered their first adventure in the Town Library when she lent him cover as they explored the rows of paperback love stories. She had carefully picked a time when the old librarian was at lunch so they could explore without disapproving glances, and let him use her library card to take out a couple of likely books, for him to get a feel for the genre. He was determined to write a bestseller. Annapurna smiled and took her coffee and skimmed a hole in the froth with the fork and added five sugars, "I am sure Toni's Diner would never run out of teaspoons." He watched, with a tingle, the fall of so much sweetener and added, "I told you, Toni's Diner is shut tonight. I don't know why." His hand picked up his pencil and started a new shape. She said, "I don't mind. I like this place. Fred and Andy have been good friends since I moved here." Maxwell felt her composure: unwavering and impenetrable. He stayed a hundred questions about her past. The cat slurped the last of the cream and looked up at her. He asked, "How is your writing going?" Annapurna sighed, "I started to write about a young, broke woman detective. But I was watching a little tv, and I find that every second show is about that same person. Maxwell, I have decided to do something different. I want you to tell me whether it is novel or commonplace. If it is commonplace, I will have to look for another theme. Will you help? I feel that I am behind all the rest of you, and would desperately wish to have a couple of pages of writing before the next meeting." Maxwell laughed, "Do not be in such a hurry. None of us had written anything of any length until a couple of weeks ago. And then it was like the tap got switched on somewhere and we are all full of words and..."
Annapurna waited, watching his eyes drift over a couple sitting, holding hands, "Maxwell?" He shook his head, "It is like I am seeing the world for the first time. Seeing the love, the angst, the hate, the passion. I can't stop the words." She let a small laugh fall over him, and his face softened, "Ok, lay it on me. Give me your theme." Annapurna started, seriously. "I think I will call my book, 'Again, Me.' I can feel the beginning." About how spring and fall go hand in hand for us. Is moderated by the despair of her departure for the other. Wake so many other memories, sad and happy still." Maxwell smiled and looked at her sipping, "A love story!" She laughed and shook her head, "No. I think it is a strange history of our world. A bit like Sputnik's 'Beep Beep' ". "I thought I would weave a story about the end of the world as we know it. A clash of the old world and the new." He speculated with a smile, "A Science Fiction Double Feature!" She pursed her lips, "A late night picture show? No. Nothing so grand. I was wondering about how libraries are being left in the dust of the new technology. I would write about how a library falls victim to technology. I would write about our town library. Well, not about it, so you knew it. But with all the people, including the old librarian and her staff." Maxwell said, "It sounds a little dry. I can't imagine that a library is all that exciting." She said, "I think that the challenges they face are pretty overwhelming. Imagine how much work they put into keeping those institutions alive, how much social capital is invested in those shelves, how important they have been for the towns themselves. And how they are becoming irrelevant to today. How the internet is going to destroy it all like some beast in an old fable." He said, "Sounds like a sad tale. How can you spark it up? Maybe a love affair between the old librarian and the local internet provider can..."
She said, "No love stories. I do not know how to tell this. I want to do something grand." He said, "Do something unexpected." The cat rubbed against her legs, and she looked down. The cat caught her eye then jumped up on the table and onto the back of Maxwell's chair. She asked, "What are you drawing." He laughed and said, "You know I doodle. It is nothing but..."
She reached out and turned the page around. There on the page shimmered a dragon, drawn draped around a book. A note on the language of Librarians. Librarians guard a lot of specialist words from the ravages of popular culture in what is called the Libris Onomasticon. It contains neat words like prosopography, epistolary, metaliterary, gravitas, sanctitas, and constantia libertas that are just as deadly as nuclear warheads and are best kept hidden from the rest of the world.